Free from sulphates, parabens, mineral oils and petrolatum. Drift into a perfect night's sleep with Sleepy Cow. Our bespoke blend of calming Melissa and Lemon Myrtle essential oils has a surprisingly citrusy scent, which is totally different to traditional lavender-based calming products. 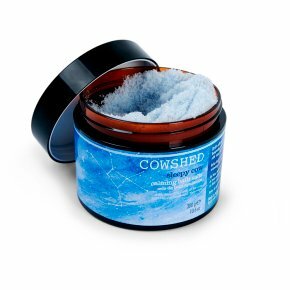 A sprinkling of our Sleepy Cow Calming Bath Salts in a warm bath is the first step to a great night's sleep. Therapeutic Himalayan Sea Salts and our unique blend of Melissa and Lemon Myrtle essential oils can help relieve tension, while Olive Oil and Vitamin E will nourish your skin so you're relaxed in mind and body when you slip between the sheets. Before bedtime, sprinkle 2 spoonfuls into a warm bath (38°C / 100°F).